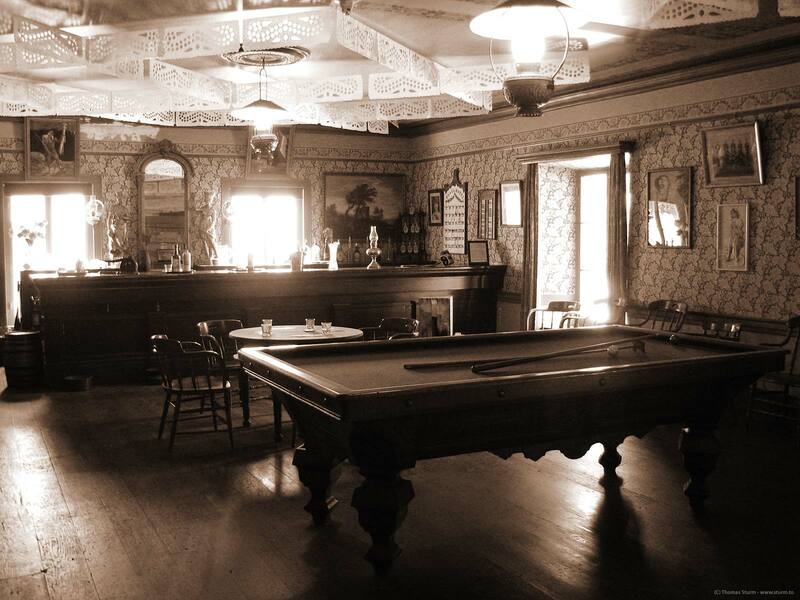 In San Juan Bautista we visited the Plaza Hotel, a venerable hotel from the mid-1800s that has been part of the state park system since the 1930s and has been preserved and lovingly restored to its 1860s glory days. Several rooms in the hotel are open for visitors and it was actually very nice to wander through the cool hallways and to escape from the relentless heat outside. It was a very nostalgic and somewhat poignant experience, since the rooms have been furnished as if their occupants just left a few minutes ago in a rush, with an unfinished dominoes game in the ladies' lounge upstairs and whiskey glasses and poker cards in the gambling room downstairs. The most impressive room on display is the bar room. It must have been quite a luxurious affair back in its heyday, with a fancy ceiling, wallpaper and a big, heavy bar. It is easy to look around the room and to imagine it full with life, travelers from the overland coach from Los Angeles pouring in late in the evening, thirsty from their dusty trip along the coast. They would have been blinded by the sudden light, dizzy from the smoke and the piano music. A drink first and then some food? Laughter and shouts of joy.